At Golf Cart Services, we stock a wide variety of golf cart parts and accessories, including 6 volt golf cart batteries. Whether you need a full set of batteries or just a replacement battery, Golf Cart Services can help you get the power you need to keep your cart running perfectly, day in and day out. Our team has been serving the Tampa Bay area for more than 30 years with Club Car and E-Z-GO golf cart repair, maintenance, and parts, and we will be happy to help you find exactly what you need. 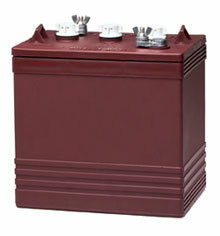 Price – For many people, price is the most important part of choosing a battery. That’s why Golf Cart Services offers a variety of 6 volt batteries to suit any budget. Running time – Whether you go out just for 18 holes or need your cart to run for extended periods of time, there’s a battery that fits your needs, and you can find it at Golf Cart Services. Longevity – In addition to how long a battery can power a cart without recharging, it also has limits in regard to how many times it can be recharged. At Golf Cart Services, we have the knowledge to help you determine exactly which battery best suits your needs based on usage and budget. For more information on 6 and also 8 volt golf cart batteries for E-Z-GO and Club Car golf carts, our other parts for sale like 8 volt and deep cycle batteries, or our golf cart services, contact Golf Cart Services today. Golf Cart Services by JB Bans. Golf Cart Service like it used to be. Copyright © JB Bans. All Rights Reserved.